How Do I Get My Compound Into Phase I? Careful assessment of the relationship between efficacy and toxicity is vital to drug developers as they seek advancement of their compounds. Nonclinical testing is required to establish a safe starting dose for the initial human clinical trials. In partnering with our pharmaceutical and biotechnology Sponsors, our goal is to improve the odds of selecting the right lead candidates, and to conduct the right studies in the right way, taking all factors into consideration to ensure a successful IND submission. As part of this webinar we will outline the nonclinical studies needed to progress a therapeutic into a Phase I clinical trial. We will cover small molecules to vaccines to biopharmaceuticals as well as standard indications to life-threatening and rare/orphan indications. Nonclinical development of gene and cell therapies has been ongoing for more than three decades, and has been increasing in recent years. In the early days of these efforts, these therapies shared the fate of many novel experimental medicine approaches with progress impeded by severe side effects in treated patients or a failure to demonstrate efficacy in the target patient population. Research over the past decade has resulted in the development of highly sophisticated gene transfer tools with improved safety and therapeutic efficacy. As these tools have been developed, regulatory agencies worldwide have adapted new review processes and developed a wide range of guidance documents to aide researchers in designing rigorous nonclinical studies to ensure the safety, biodistribution and potential benefit of these advanced therapeutics. This presentation will provide an overview of the regulatory guidelines, provide some key considerations in the nonclinical development and testing of cellular and gene therapies, and detail several case studies of these therapeutics. Developments for new therapeutics to target various aspects of auditory system dysfunction is on the rise within the drug development industry. Join Rachel as she reviews nonclinical auditory safety programs, including standard and non-standard endpoints. She will also share in-depth answers to common questions regarding species selection and study timelines. A poor animal welfare program can derail your preclinical research. Join Chris Dillon as he examines the importance of animal welfare as it relates to drug development costs, compliance, and factors for considerations when outsourcing preclinical programs. SEND requirements are now in effect and many companies have implementation questions: Is SEND required for this study? What are the components of a complete SEND dataset package? What should be done with endpoints not modeled in SEND? This webinar will provide answers to those questions and provide best practices for determining how SEND requirements should be applied. According to the ICH Harmonised Tripartite Guideline: Guidance on Nonclinical Safety Studies for the Conduct of Human Clinical Trials and Marketing Authorization for Pharmaceuticals M3(R2), both men and women of child bearing potential (WoCBP) can be included in Phase I and II trials before the conduct of the male and female nonclinical fertility studies, since an evaluation of the male and female reproductive organs is performed in the repeat-dose toxicity studies. As such, much of the early assessment of potential test article-related effects on the reproductive system falls on the nonclinical toxicologic pathologist. This requires the pathologist to have a have a sound understanding of spermatogenesis, stage-aware evaluation of the testis, estrous and menstrual cyclicity, and normal physiology and endocrinology in order to carefully and thoroughly evaluate potential xenobiotic-related effects on the reproductive system. However, even with the most thorough pathology assessment, the design and conduct of nonclinical general toxicity studies can greatly impact the pathologist’s evaluation of the reproductive system. Commonly encountered challenges include age (onset of puberty and reproductive senescence), body weight changes and systemic toxicity, husbandry practices, strain differences, small sample size (non-rodents), and even histologic sectioning patterns. Preclinical laboratories face several challenges when conducting animal studies requiring Biosafety Level (BSL) 2 level containment. Some of these challenges include informed study design (including knowledge of associated regulatory guidelines), proper preparation of the vivarium, species isolation, traffic control between containment areas, training of personnel, veterinarian care, and proper decontamination of equipment/waste/bedding prior to disposal. In addition, proper post-life handling of animals and samples, with focused attention on tissue sampling and specialized evaluation is a vital element in ensuring personnel safety and high scientific quality. Overcoming these hurdles will generate high quality data and allow for a safe and productive environment. A primary challenge for pharmaceutical and biotechnology companies in developing their drugs is to carefully assess the relationship between efficacy and toxicity before entering into human clinical trials. Nonclinical testing is required to evaluate the potential efficacy of a new therapeutic and establish a safe starting dose for initial human clinical trials. Knowing when and where to invest your time and effort in preparing for these nonclinical studies is a critical component of a company’s drug development strategy. Many companies outsource their nonclinical testing to contract research organizations (CROs) and have little to no prior experience in working with a CRO. There are a number of technical challenges involved in the process of outsourcing, which if not taken under consideration, can cause delays and unexpected expenses in developing a compound. These challenges range from determining which species is appropriate for your project to basic formulation and dosing aspects. Being aware of and mitigating as many of these challenges early in the process as possible reduces the potential for delays and allows a company to proceed with increased confidence. This webinar will describe some common technical challenges that we have encountered while working with our Sponsors. Grace M. Furman, PhD, DABT; President & CEO, Paracelsus, Inc. Ronald Christopher, PhD, DABT, VP, Arena Pharmaceuticals, Inc. The CRO+Consultant+Sponsor Relationship: Collaborating to Ensure Sponsor and Client Success.Collaboration is the key to a successful consulting partnership. This webinar will focus on the responsibilities and perspectives of key stakeholders (Sponsor, consultant and CRO), how to make the most out of the Sponsor/consultant relationship, and key considerations when partnering with a contract research organization. Explore ways to optimize your consultant relationships to ensure success! We all need to do Absorption, Distribution, Metabolism, and Excretion (ADME) studies to support an NDA submission, but when does ADME data best support the story we are crafting for the agency? When can it benefit us most scientifically? When can it help us move our program successfully forward? ADME studies are a vital part of the comprehensive safety evaluation of a new therapeutic entity, whether biologic or small molecule in nature. In vitro ADME evaluations typically inform the nonclinical species selection and give insight into the potential clearance and metabolic profile. All of these data must be confirmed in vivo. In vivo ADME studies in laboratory animals (rodents, dogs, nonhuman primates, etc. ), typically using some form of the radio-labeled therapeutic entity, are required before NDA submission. These in-life studies provide information regarding pharmacokinetics, biodistribution, rates and routes of elimination, metabolites, relative bioavailability, formulation, dosing frequency, exposure, etc. This is all information that can be leveraged at different points in the drug development process to select a lead compound, add value to that compound, enhance the quality of safety studies, or inform decisions about clinical design. The earlier in the drug development pathway that in vivo ADME data are available, the sooner this information can be leveraged in the design of the nonclinical and clinical development plans. This presentation will focus on the questions around when to conduct the nonclinical ADME studies (pre-IND, Phase I, Phase II, Phase III, pre-NDA) to give the greatest benefit to your program, and how to optimize the design to be most expeditious and cost effective while still delivering the necessary data. The advent of advanced therapeutics such as proteins, viral vectors, stem cells, oligonucleotides and compounds encapsulated in liposomes or nanoparticles have allowed potential therapies for a number of previously undertreated or untreatable central nervous system (CNS) diseases. These include neurodegenerative diseases (Parkinson’s, ALS, Alzheimer’s, Huntington's and spinal muscular atrophy), disorders of lipid metabolism or storage (lysosomal storage diseases), CNS cancers (glioblastomas and meningiomas) and pain. A common issue encountered by all the therapeutic modalities for these disease states is how do you deliver treatments where they are needed at therapeutic levels without producing adverse systemic effects? The increasingly common answer to these issues is the use of targeted delivery. This may include acute, intermittent or continuous delivery to the cerebral spinal fluid (CSF) either by intracerebroventricular or intrathecal administration, direct intraparenchymal or intratumoral delivery with or without convection enhanced delivery (CED) and epidural or perineural dosing. This webinar will focus on the unique aspects related to performing preclinical toxicology studies for targeted therapies within the CNS. These include issues of choosing the correct species, route of administration, performing pharmacokinetics and biodistribution analysis and histopathology. Understanding the key considerations driving appropriate study designs to provide data, which are impactful on study specific objectives, as well as, inform high-level program decisions is critical for the execution of successful imaging trials. Likewise, robust, scientifically sound data analysis and accurate interpretation of results is equally as important when applying imaging as a solution within development efforts. Contemporary drug development is well understood to be a lengthy process. Translational research approaches, focused herein on those involving molecular imaging (MI), have improved to decrease time through both micro- and macro-level assessments through the provision of robust data sets. As a multidisciplinary field, the focus of MI is the evaluation of biological processes at the molecular, cellular, whole organ, and/or system level in vivo. Improvements in imaging instrumentation and informatics over the past decade have enabled an increase in novel, translational in vivo imaging applications with comparable (relative) resolution and sensitivity between preclinical and clinical imaging. This webinar will focus on how translational molecular imaging is employed in drug development through presentation of fundamental key considerations in study design as driven by analysis defined requirements which ultimately facilitates sound data interpretation. The research approaches presented will demonstrate how imaging can be successfully applied in development efforts providing data upon which informed decisions can be based in preclinical and clinical efforts. All participants will have the opportunity to ask questions and discuss relevant issues. The United States Food and Drug Administration (FDA) require that otic microscopy be performed on all drug formulations that penetrate the tympanum, or are suspected to come into contact with the middle or inner ear. The auditory system contains critical structures within the middle and inner ear which act to amply and conduct sound before neural processing. Drug-related tissue reactions can result in conductive hearing loss, making otic microscopy a decisive endpoint when determining drug effects on hearing. This webinar will address which otic structures should be evaluated on auditory safety studies to assess impact on audition. Approaches to tissue processing, orientation, and microtomy will be discussed, as the middle and inner ear are embedded in bone and yielding satisfactory slides for histopathologic evaluation can be challenging. Furthermore, this webinar will provide an overview of background pathological findings and drug-related tissue reactions observed in laboratory animals. The auditory system is responsible for complex processing of environmental stimuli to ultimately enable appropriate integrative responses. This system is regularly exposed to noxious noise intensities as well as drugs and chemicals, potentially precipitating system compromise. Accordingly, the development of new therapeutics to address various aspects of auditory system dysfunction represents an area of intense industry focus. To evaluate the efficacy of a drug regarding preventative or restorative effects on audition, sensitive animal models must be developed to reliably detect changes in relevant endpoints. This presentation will review animal models of otic disorders used to characterize drug candidate efficacy. Specifically, animal models of aminoglycoside ototoxicity, cisplatin ototoxicity, aspirin-induced tinnitus, noise-induced hearing loss, and age-related hearing loss will be discussed in depth. Additionally, available in vivo and histologic immunofluorescent techniques will be reviewed according to opportunities for the incorporation into these models. This webinar will focus on reviewing available research models, including practical considerations for preclinical study designs, as well as providing an overview of the regulatory requirements for evaluating the safety of ingredients in infant formula. Cellular therapeutics have great potential for treating a wide variety of medical conditions, with applications in both acute and chronic diseases. Embryonic stem cells, adult stem cells, and induced pluripotent stem cells compose the basis for this therapeutic area, and each may be administered with their efficacy dependent on factors including the cell delivery route, the degree of cell engraftment, the potential activation of resident cells, and their functional integration into the diseased tissue. This presentation will cover the preclinical safety evaluations necessary to enable clinical trials for this therapeutic category. Strategies for the design of toxicity, biodistribution, and tumorigenicity assessments will be discussed. Special emphasis will be placed on the use of various delivery strategies to ensure the administration of sufficient cell numbers to disease-relevant anatomic locations. In addition, state-of-the-art in vivo molecular imaging strategies for the determination of various cellular test article parameters, from efficacy to biodistribution and fate, will be presented. The ICH S7B guidelines recommend in vitro assessment for drug-induced prolongation of the QT interval for most small molecule IND submissions. The hERG (human ether-a-go-go-related gene) channel is an inward rectifying potassium channel that controls the cardiac action potential repolarization. Drugs that inhibit the hERG channel have the potential to prolong the cardiac action potential and cause torsade de pointes. A broad range of in vitro concentrations assessments on the hERG channel activity relative to the Cmax plasma levels will give an estimated safety margin for the liability for delayed ventricular repolarization. Formulation analysis of the test article in study vehicles are needed to determine the concentration, uniformity, and stability of the formulation. For hERG studies, the vehicle is a physiological salt solution (PSS). Depending on the physicochemical characteristics of the test article, the development of a suitable analytical method for the analysis of the test article in PSS can pose unique challenges in the areas of solubility, stability, and recovery from the formulation for analysis. All challenges require analytical expertise in method development and a methodical approach so that a suitable method can be developed and validated. Contemporary drug development is well understood to be a lengthy process. Translational research approaches, focused herein on those involving Molecular Imaging (MI), have improved to decrease time through both micro- and macro-level assessments. As a multidisciplinary field, the focus of MI is the evaluation of biological processes at the molecular, cellular, whole organ and/or system level in vivo. Improvements in imaging instrumentation and informatics over the past decade have enabled an increase in novel, translational in vivo imaging applications with comparable relative) resolution and sensitivity between preclinical and clinical imaging. Understanding the significant variances between protocol execution and data processing demands between a preclinical laboratory and the clinic is critical for the successful design of a robust development program. This webinar, part one in a two-part series, will focus on how translational molecular imaging is employed in drug development through the presentation of a broad array of case studies. The research approaches presented will show how MI bridges preclinical development efforts with clinical efforts in an effort to gain both time and cost efficiencies. All participants will have the opportunity to ask questions and discuss relevant issues. MPI Research exceeds expectations through consistency and quality, with a commitment to communication and innovation, delivering benefits throughout all phases of drug and device development. Learn how we can go beyond for you at www.mpiresearch.com. 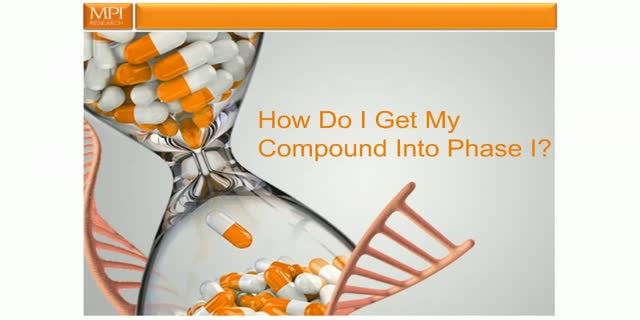 Title: How Do I Get My Compound Into Phase I?